Sunday morning rolled around after an exciting evening of trying all new things. I’ve never been much of a church person but I have tried this past year. I guess I am just not motivated enough to go, but who knows! I knew I was going to church with Jan and Gene on Sunday morning and I had no idea what I was about to get myself into. I had no idea what religion I was about to sit through or how I would fit in. Jan had said I didn’t have to go but, of course I wanted to. Like I have said before, I was there for the experience! You just have to jump right into something new and don’t be scared. If fear is the reason you don’t do something, you will regret it later on. The feeling of regret is one of the bitterest feelings in my opinion. The church that I went to was the First United Methodist Church of Greensburg When got there, lots of people greeted me with a smile because they were genuinely nice people. I was a little hesitant but it soon dissipated once the sermon had started. At one point, I was introduced to Pastor Terry Mayhew. He was extremely welcoming and was happy to see that I had come along with Jan and Gene. After the sermon was over we headed on our way, back to the house so I could finish packing the last bit of my stuff. Once I was done packing, we were on our way to meet the next family I would be staying with in Pratt, KS. When you start traveling in a new state with people who know where they are going, you tend to not ask questions but wonder in your head where you are being taken! Lots of the time, I had Apple Maps up on my phone to know where we are and how close we were to our final destination. I didn’t want to be like a kid and ask repetitively, “Are we there yet?” Having the handy iPhone in my hand made the drives easier because I knew approximately how long it would take to get to places. Pratt was about a half hour away from Greensburg and about an hour or so away from Hutchinson. In Pratt, we met up with Mark and his girlfriend Geneva; to of whom I would be staying with next in Hutchinson, KS. We met at a local restaurant called Uptown Café & Club D’Est for lunch. They have a great brunch buffet on Sundays only that we got to have! Great place and would definitely recommend it! After lunch, I said my goodbyes to Jan and Gene and took off with Mark and Geneva. On the hour long ride to Hutch, Mark said we are going to go to Strataca. 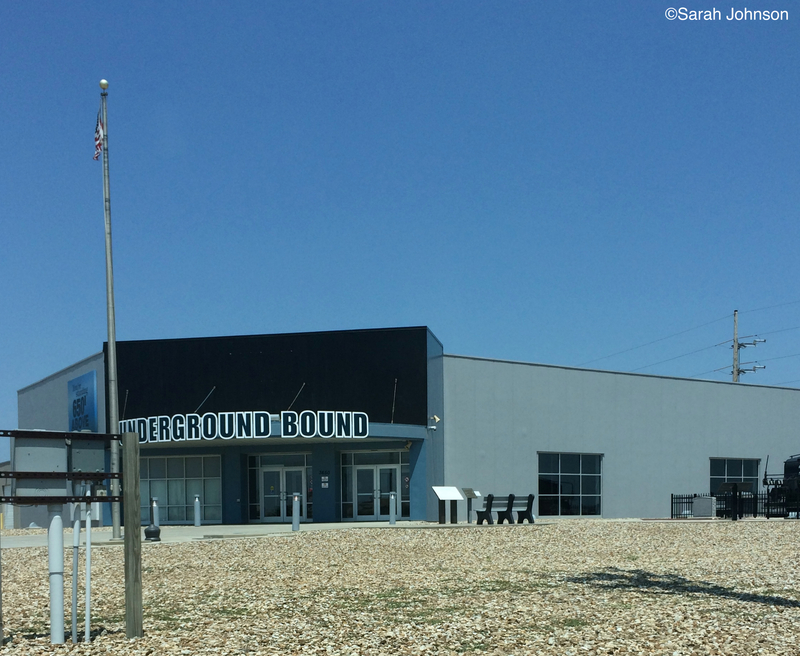 Strataca is the Kansas Underground Salt Mine Museum and known as one of the “Eight Wonders of Kansas”. 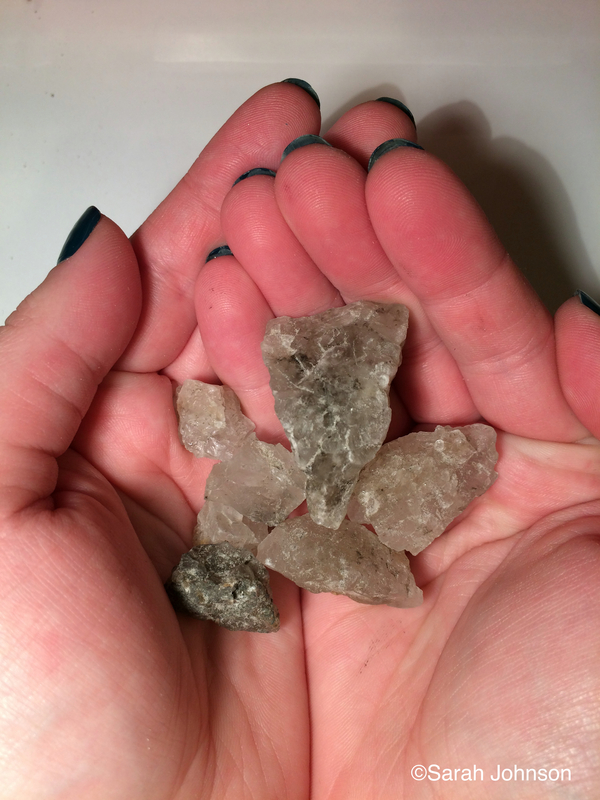 The mine was opened in 1923 and known as the Carey Salt Mine. The salt, however, is from the Permian Sea when it dried up over 275 million years ago. 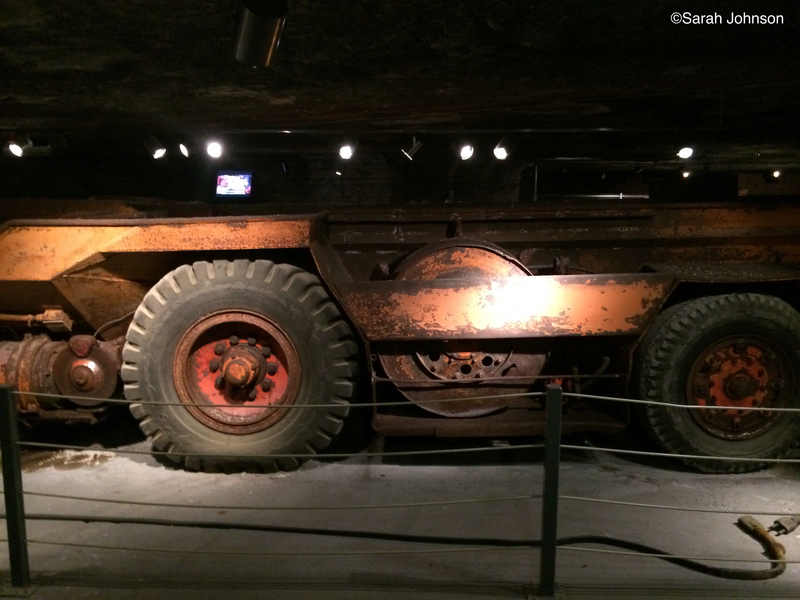 Upon entering the Strataca there is some information about the mine and videos playing of the museum. Groups go down into the mine at 20 minute intervals. When your group is called to go down to the mine, you are required to watch a short video on safety in the mine. If you really want to watch it, you can watch it here. You are also required by mine safety regulations to wear a hardhat and carry an emergency respirator. Luckily, there has never been a reason to use the respirators and hopefully there never will be! WHO IS THAT GOOD LOOKING PERSON STANDING NEXT TO THAT GINORMOUS CHUNK OF SALT?! Oh wait, nope, never mind, that’s just me! Look how tough I look wearing that hard hat! Just kidding! 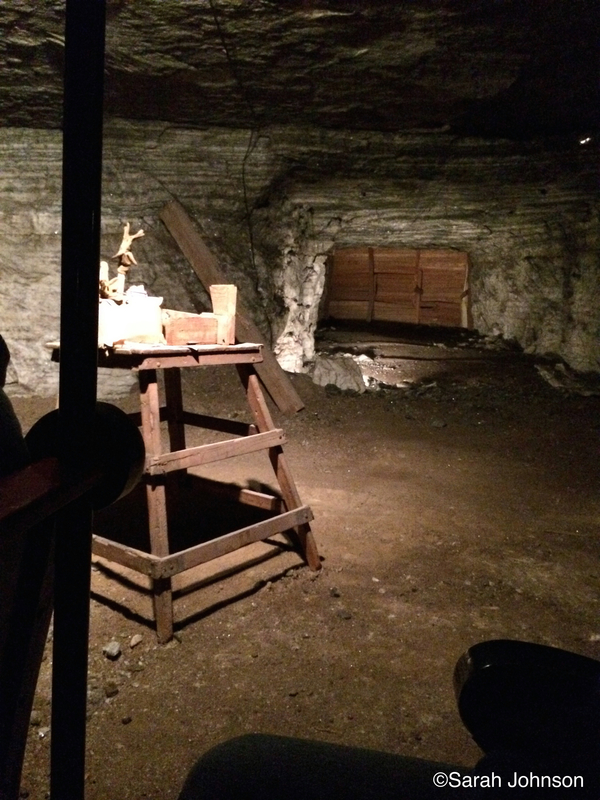 Once you get geared up and watch the video you are ready to go down into the mine. You and your group then board one of the levels of the double-decker elevator. The maximum amount of people on each level of the elevator is 15 people and boy can it get a little crammed in there! 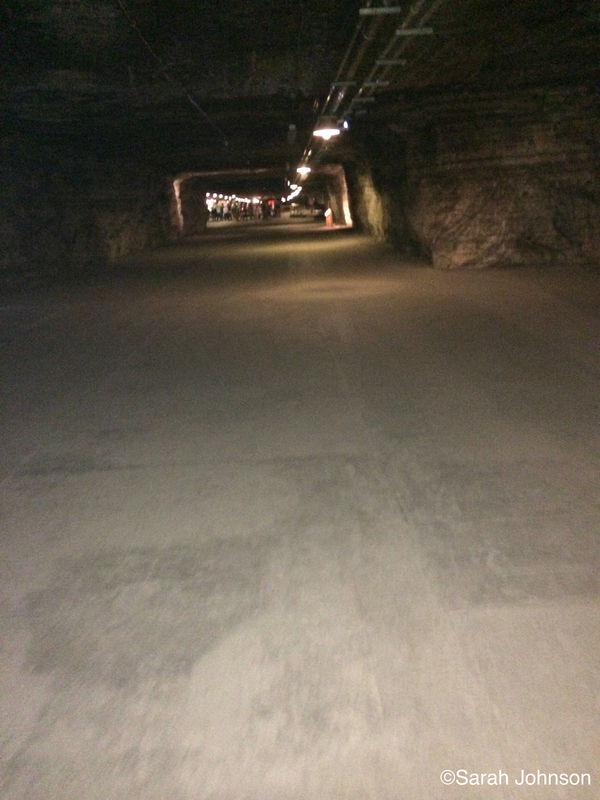 They shut the lights off and for a minute and a half you ride 650 feet undergroun to the actual mine itself. I know the photo isn’t focused very well but what do you expect for iPhone photography in low lighting. When you reach the bottom you will notice a completely different environment. The temperature is a comfortable 68º and the humidity is around 45%. Once you are down there you can walk through and there are different pieces of equipment that had been left from when the mine was active. Equipment was brought down to the mine in pieces and built there so, once it was built it was down there to stay forever. 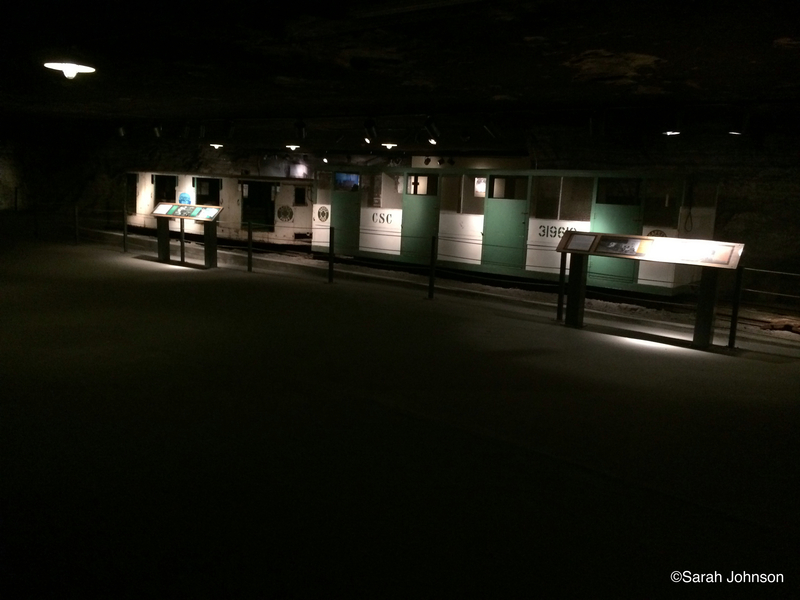 Mark had bought admission tickets that we could get on a tram and ride through the mine as a guided tour on the Salt mine Express. I didn’t take my camera down there because I wasn’t sure of how the temperature, humidity, and lighting would be so instead I opted to leave it in the car; where the sun was probably borderline frying it anyways. WHOOPS! That and all of my luggage. Is it sad that all I could think of for a while was “Is my makeup melted and how much money will I have to go spend at Sephora to replace it all when I get home? But thanks to TSA rules, I packed mostly non liquids. Achievement points for Sarah. 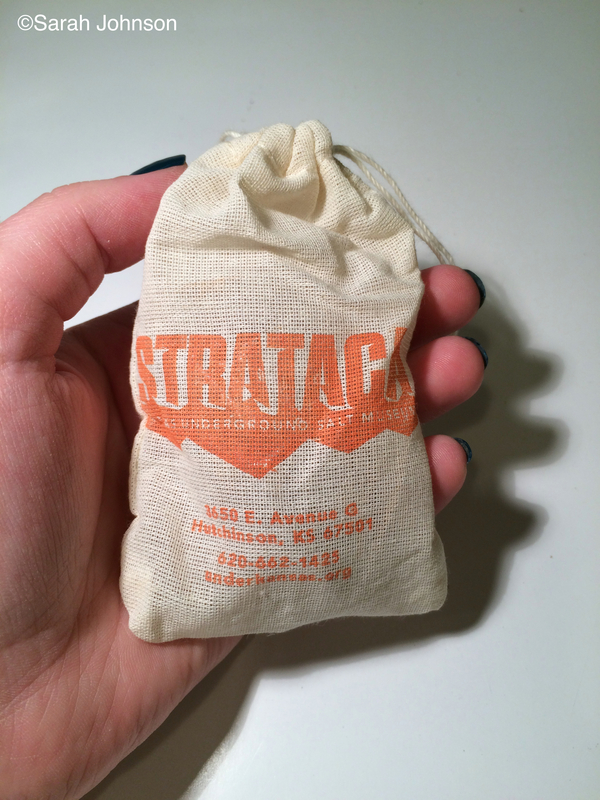 Anyways, back to the topic of the Strataca! So you can see here that this is a big piece of equipment that should run on gas or diesel right? Absolutely not. There isn’t enough oxygen down there led alone for a fuel run piece of equipment to run in an area like this. They were electric! The trucks would get so far and then have to be recharged to continue. Mark had all these neat facts about this place. Facts that they don’t tell you in the tour. This was one of Mark’s facts! As you can see in the photo above, that is a pile of trash. Just like the equipment, the trash was also left down there. The miners also didn’t ride up the elevator to use the bathroom so guess what, they also got to do their business down there and it was left there. Disgusting, I know. There was a toilet located just a little further down the mine from this pile of trash but I’ll save you the vision of it and not include a nasty toilet! In the way back of the photo above, you can see what looks like a boarded up passageway. This is called a bulkhead and it directs airflow. 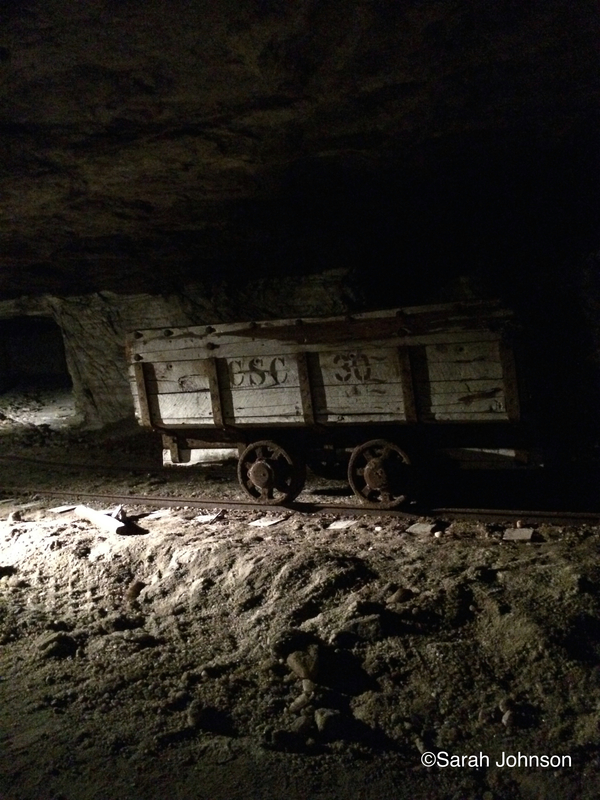 It is built with 1.5″ planks and supported with massive 6″x6″ timbers and sealed with black tar paper on the backside to keep from air from that side of the mine coming into the other part that you are currently in. Miners would wear gloves until they wore out the palms and then flip them over and wear them out on the other side also. They were very conservative during the war back then. 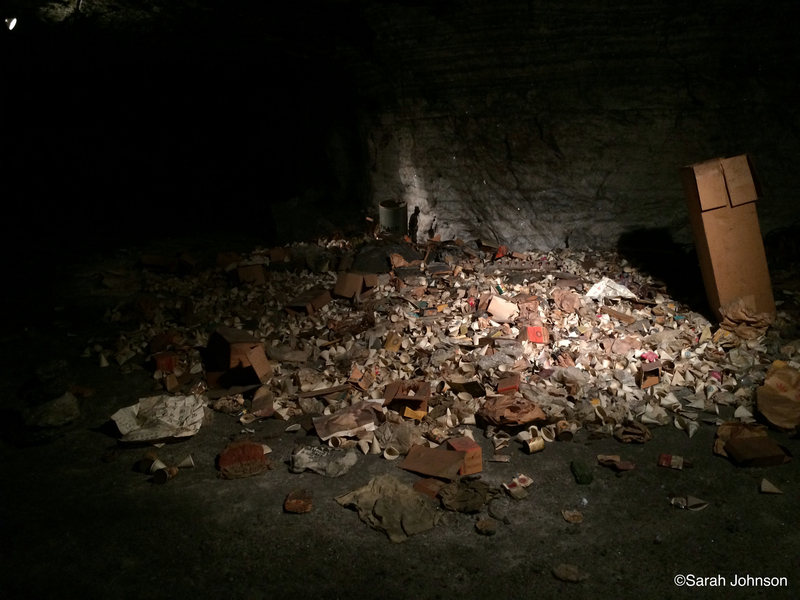 The miners were also told not to leave their trash in the mine but we can all see how that worked out for them! Some of the meant stuffed their old, worn out gloves into the dynamite holes! 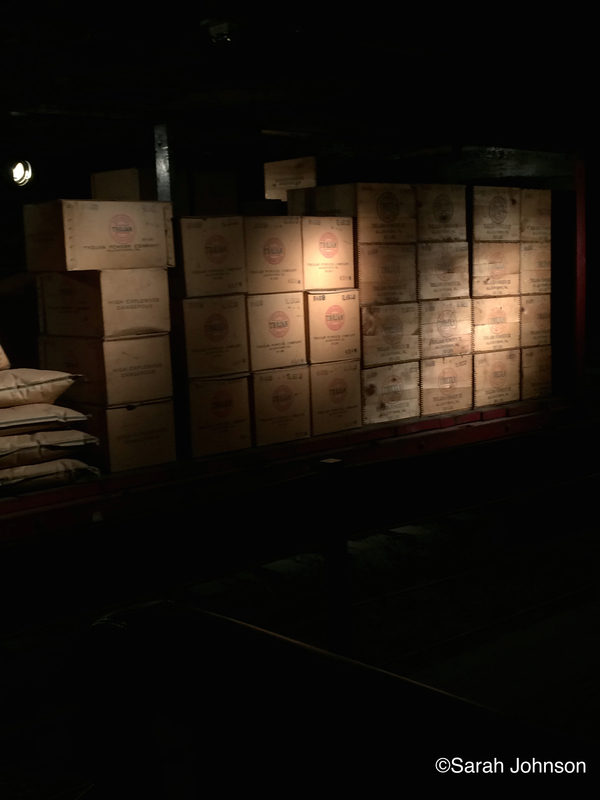 As you can see, there are lots of boxes of dynamite here. This is what creates the actual mines itself. 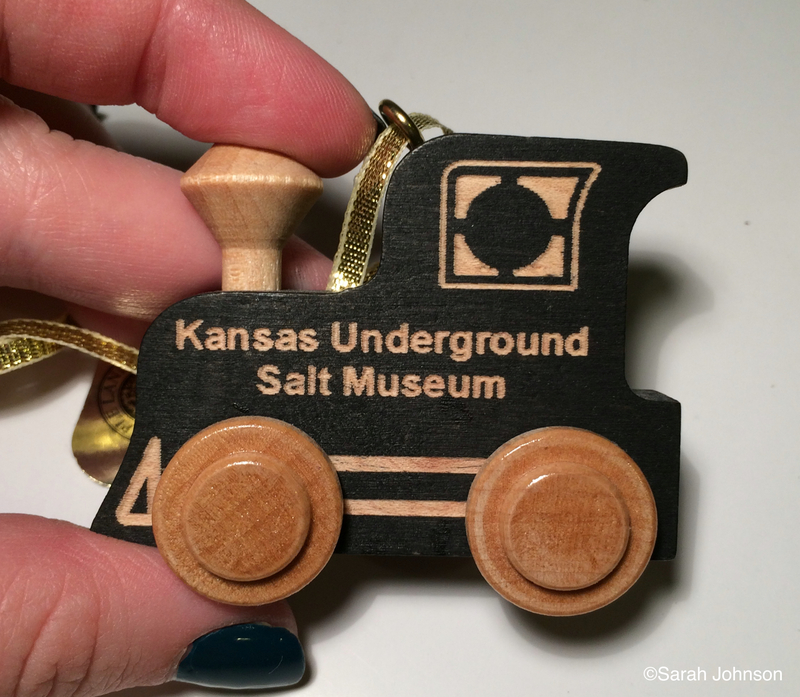 During our train ride through, they stop and everyone can get out and take some souvenir salt pieces home. You can pick up one as big as you can carry or you can choose to fill a small little bag! I choose to fill the small little bag because I had to be under my 50lbs for the luggage home. Otherwise, I would have taken a huge chunk out of that mine! You can see below how adorable this little bag was! After we were done with the tour, which I HIGHLY recommend you take if you ever go, I stopped at the gift shop and bought a little souvenir! I figured a train ornament was a pretty accurate reminder of Strataca! I bought a small little train ornament to go on the Christmas tree but, I forgot that it was on my high up shelf in my room so it didn’t make it on the tree this year. Maybe next year! Since the temperature and humidity is so low and comfortable, this makes a great place for storage. There are storage values for lots of companies down in the mine. However, the cool part was, they have vaults of old film reels and movie props. You should be informed that I have a deep love for the movie Twister. Yes, the movie with Helen Hunt and Bill Paxton chasing tornados. It’s most likely my favorite movie of all time. I can watch it day after day and never get tired of it. 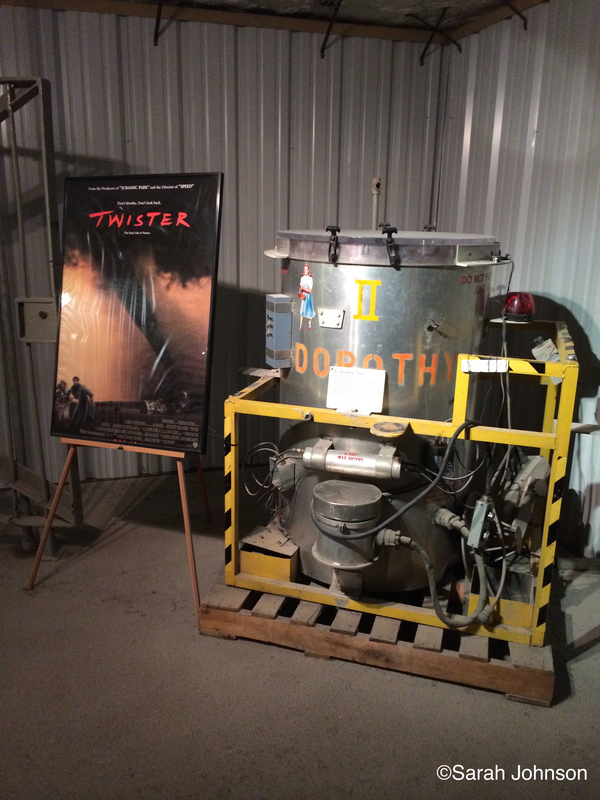 I had a hint that there was a prop form Twister down in the mine but I didn’t know for sure. 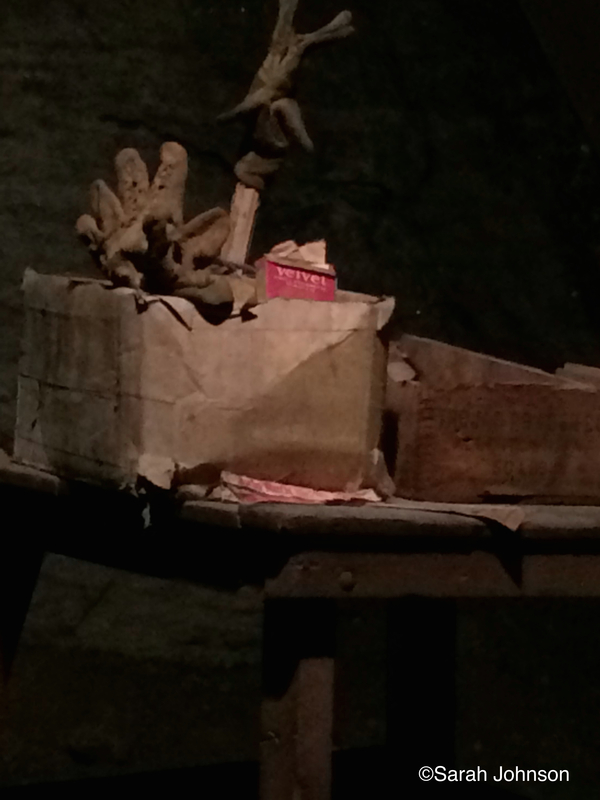 I think I fangirled just a little on the outside but nearly died of happiness when I saw the prop in person though! It was the DOROTHY II!!!!!!!! I mean sure, there were props from other movies such as Men In Black, Star Wars, Batman and more but I didn’t care about that stuff. I just wanted to touch the DOROTHY II! I didn’t touch it obviously but, I sure as anything wanted to! Want to know a secret? I’m watching Twister while typing this. Well, I guess that’s not really a secret anymore but oh well! 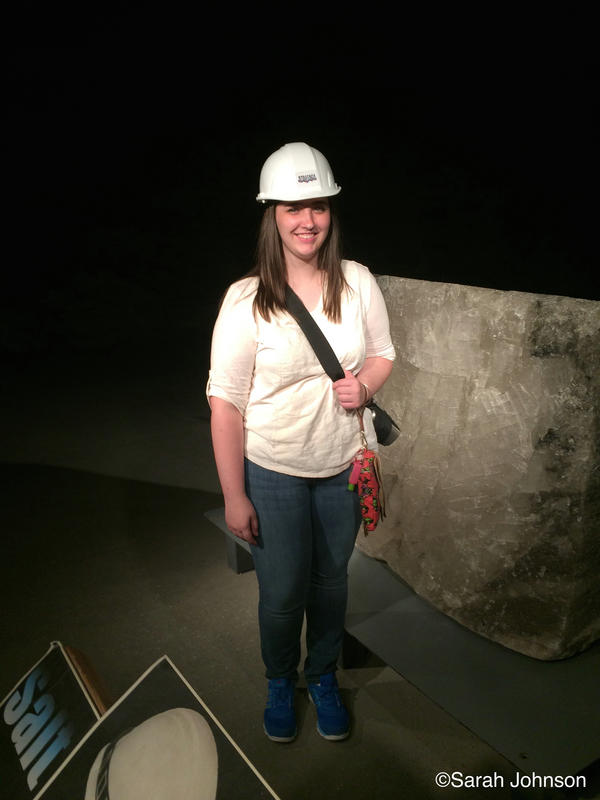 Once we were finished at the salt mine Mark and Geneva took me on a tour of Hutchinson. They also stopped so I could take a photo of the worlds longest grain elevation! The only grain elevators I’ve ever seen are small and compact. This however was anything but small and compact. 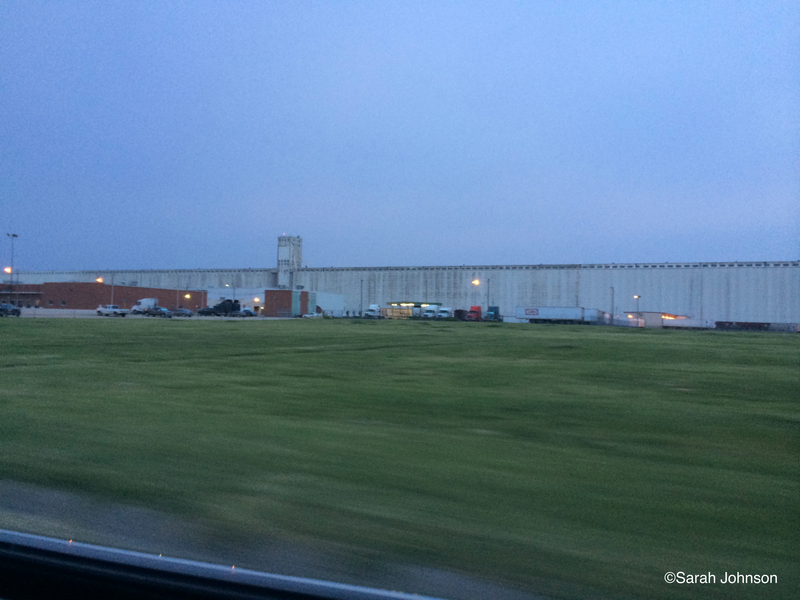 The elevator stretches for about a 1/2 mile and holds 18.2 million bushels of wheat! THAT’S A LOT OF WHEAT! Again, iPhone quality is not always the greatest especially when it starts to get dark. There are train tracks that run along side of the elevator and stop to fill up the train car, then they are on their way to the next grain elevator 8-10 miles away. There is a farm supply and grain elevator every 8-10 miles because, obviously, there is high demand for them since it is all farmland out there! We ended our tour back at Geneva’s house and I got to meet her sweet basset hound, Sophie! Ironically, Mark lives right across the street from Geneva so it was easy to go back and forth to their houses! Geneva had an amazing collection of Mickey Mouse memorabilia in her basement. Mickey Mouses everywhere! Truly an accomplishment to have a collection like that. Mark however, had an amazing collection of Coca-Cola memorabilia in his game room/basement. But not only was there Coca Cola, there were arcade style pinball, Ms. Pacman, and Space Invaders. Sadly, we couldn’t use the pinball machine because it needed a repair. I still expect a pinball tournament with Mark when I come back out though!! That evening, I got to meet Mark’s daughter and her family. We all went out to dinner at Applebee’s; it was like being back at home! After dinner, we went back to Geneva’s house and played Mexican train dominos. I had never played this game before in my entire life but it was easy to learn and a lot of fun! We all got along great and I’m so glad that it was a fun night at the house rather than running around everywhere! Stay tuned to see what else happened on this trip!